The Desert Scorpion has one of the longest life spans of all scorpion species. It is also called the Giant Desert Hairy Scorpion and the North American Hairy Scorpion. Desert Scorpions are the largest scorpions in North America. They are between four and seven inches long. On average they only weigh 0.18 ounces. Males and females are similar in appearance. They have excellent eyesight. They are tan to olive-green in color with a darker back and yellow pedipalps, legs, and tail. They have tiny erect hairs covering their whole bodies through which they detect vibrations in the air (sound) or ground. It is what allows them to track their prey. Like all scorpions, Desert Scorpions are considered arachnids like spiders. Arachnids are identified as having eight legs, no wings, and no antennae. Scorpions have three body segments. The prosoma or cephalothorax (head) that contains the eyes, the mouth and the pedipalps that look almost like claws with pinchers on the end called chelae. The main body, called the mesosoma, is actually seven segments. This section is where the four pairs of clawed walking legs are attached and also contains all the major body organs. The characteristic tail section is called the metasoma and it is five segments ending in the telson that contains a pair of venom glands and the stinger. Desert Scorpions are nocturnal. They live in abandoned burrows, crevices and small caves where they are protected from daytime heat. They hibernate in winter. Caves are a favorite dwelling because the temperature is naturally balanced and they are also home to many prey species. In suburban environments they seek out ornamental plants and irrigated lawns that attract beetles and other prey. Desert Scorpions are ambush predators. They wait inside their burrows for prey and they grab it with their front pedipalps and sting it with venom to subdue it. Like all scorpions, the Desert Scorpion is venomous but its venom is weak and sometimes has no effect on lizards or small mammals. Desert environments between 3,00 and 6,000 feet in elevation. They are native to the Mojave and Sonoran deserts in the southwestern United States. They can also be found in Utah and Nevada. Desert Scorpions are solitary creatures. They give birth to live young. The average litter size is 30. The young are almost fully formed but they are small, white and vulnerable at birth. They lack a fully developed epicuticle (the outermost waxy layer of the exoskeleton) so they will crawl onto the mother’s back and remain there for about three weeks. This helps the young regulate temperature and moisture levels. Once they have gone through one molt they can live independently. The male plays no role in parental care and are occasionally eaten by the female after mating. Carnivores. Their prey consists of organisms of similar size, including insects, spiders, lizards, small mammals and other scorpions. . The life span is up to 10 years in the wild or up to 20 years in human care. 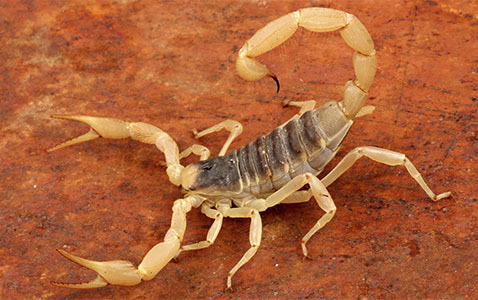 Not Listed/ Although the Desert Scorpion is not listed, its desert environment is threatened by development, environmental changes and natural resource allocation.